My girls fell in love with this "Jello Popcorn" recipe that we tried out last week. This week we decided to make some red, white and blue popcorn in honor of Memorial Day. It's super easy to make and odds are, you have everything in your pantry already. In the medium size saucepan, mix all the following well, and over medium-high heat bring to a boil. Continue to let it boil while stirring it, for about 3 or 4 minutes, till it is nice and thick. Pour the Jello mixture onto the popcorn and stir it until the all the popcorn is well coated. Pour the popcorn onto the Pam coated baking sheet. Bake it for 20 mins, stirring once halfway through. Remove from oven and place cookie sheet on a wire cooling rack, or transfer popcorn to another baking sheet lined with foil. When cool break apart into small pieces. For the red popcorn, I used strawberry flavored jello, for the blue popcorn I used berry blue. For the white, I just left the popcorn plain. If you wanted to go all sweet you could use microwave kettle corn instead. The Berry Blue Jello was a little bit lighter blue than I had envisioned so I dropped in two drops of food color to darken it a little. My girls had fun measuring out the ingredients and then bagging it up to give away to their friends! Think of all the fun colors you can mix up for different holidays! How long was it good for? I would love to make this for our 4th of July vaca but I would have to make it a couple of days early. I know popcorn is funny like that. Great idea!! The longest we have kept it is for a week in a Ziplock and it still tasted good! Enjoy your vacation! I'm adding these treats to my July 4th party. Love the idea. Thanks!!!!! My kids are popcorn fanatics, so we're definitely trying this next week. Also, I'm planning on linking to this post in my 4th of July recipe post on my blog. Would you mind if I use the picture from your site (I'll credit you and link to you, of course)? Looks so yummy. I can't wait to make some for the 4th. Thanks for sharing!!! I'll be making this as our fireworks watching treat! Looks yummy and adorable! I featured you over at www.justpleasedaspunch.blogspot.com. Check it out! @Amy at Just Pleased as Punch. Thanks soo much for featuring me. I checked out your blog - very cute! I am your newest follower! I hope it's okay I linked this to a blog post! So darling. This is a really cool idea. It would make great treat bags for kids during the various holidays at my son's school. Just change up the colors. Thanks for sharing. 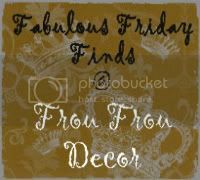 @Courtney at A Thoughtful Place - Thanks for featuring me - I'm now following your blog - very cute! I love this idea! I made it for my son's birthday party (which happens to be on July 4th!). I linked to this from my blog! Thank you for sharing. @Kate at Craftwhatever. Thanks for the mention. I can't believe you threw all that together in a day especially after coming back from your vacation!! My sister's b-day is on the 4th too and for the longest time she thought all the fireworks were just for her LOL. Is this grandular in texture when it is done or do you get a soft, smooth, candy like finish??? I have made two different versions of this and both were very sugary (grainy) when baked. I usually use the smaller amount of sugar and mix it really well. Be sure not to "over boil" it or will get more grainy. I've found that cooking the popcorn on low heat in the oven really does give it that candy coating taste. 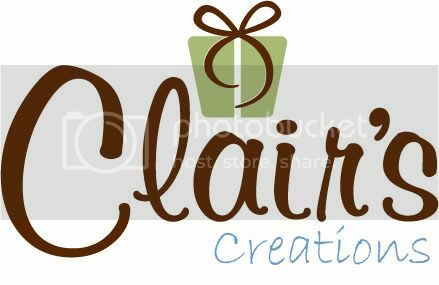 Thank you Clair for your prompt reply. I will give it a go with the small amount of sugar and be careful not to boil long and hope for the best. 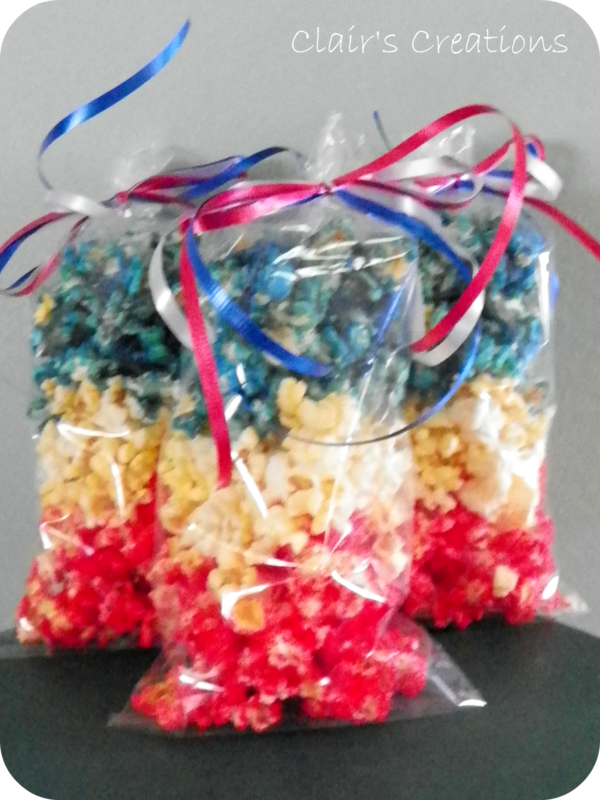 I found your patriotic popcorn on tipjunkie and followew the liink to here. I was so glad to see this reciepe. I have beed trying to find a way to dye popcorn but I keep failing. I think this might do the trick. I'm gonna try your colors and then something for St.patrick's day. We always had these giant bags of green popcorn that my dad used to bring home(except not sweet). So it's the memories that go with it for me. So in other words thank you very much. And I hope this works out for me. Thank you! Just curious, is it supposed to be a little soggy? I only used 1 bag of popcorn, all I had in the house and my son was too excited to wait to go get more. It turned out a little soggy, but I was thinking it might be because the popcorn was drenched in the jello. Does putting it on more popcorn make it crunchier? I've never had it turn out soggy for me. My guess is there was too much syrup for the amount of popcorn. If you do want a lot of syrup on it, I would try cooking it longer, or even just turning off the heat but leaving it in the oven with the door closed so it can dry out. If you make it with more popcorn, it should come out nice and crunch! We had made this for the Utah Pioneer Days celebrations. Each child in our group was given a baggie with the colored popcorn and it was a HUGE hit!!! Everybody (children and adults alike) loved the flavors. It was perfect! I'm so glad the kids had a great Pioneer Day and enjoyed the popcorn. I would like to use fresh popcorn, instead of microwave popcorn. Do you know how many cups I should use? Hi I love this idea... can I use butter? Or those it have to be margarine? I just made for the 4th of July with berry blue and strawberry. I also did the "white" with Knox gelatine to give all of it the same flavor. Taste great and looks amazing. Thank you for the idea. @Anonymous Sorry for thelate reply, I hope you figured it out. A bag of microwave popcorn has about 8 cups in it. Hope it workded out well with the fresh popcorn. @Chystalightning - you can absolutely use butter. I usually use two bags of popcorn. Each bag of popcorn has about 8 cups of popped popcorn in it. @Deb So glad you enjoyed it. Great idea to use the Knox gelatine so that it all has the same taste and consistency! I found clear jello! It is Royal brand, Disney Frozen themed with Olaf on the front! It says it's summer berry punch flavor but I think it tastes like watermelon! I found it at Walmart! Mine turned out great! Thank you for the idea and recipe! This is great!! Did you still add everything else to the white popcorn other than the jello coloring? And bake for the same amount of time?